The 125cc commuter segment is perfect for those who are looking for a bit more power than a 100 or a 110 cc commuter, but also be practical enough for daily commutes. The Splendor range has been doing well in the market since its launch way back in 1994. Eleven years later, Hero launched the Super Splendor for people who want the Splendor’s pedigree but with a bit more power. Over the course of time, it was updated with new features. 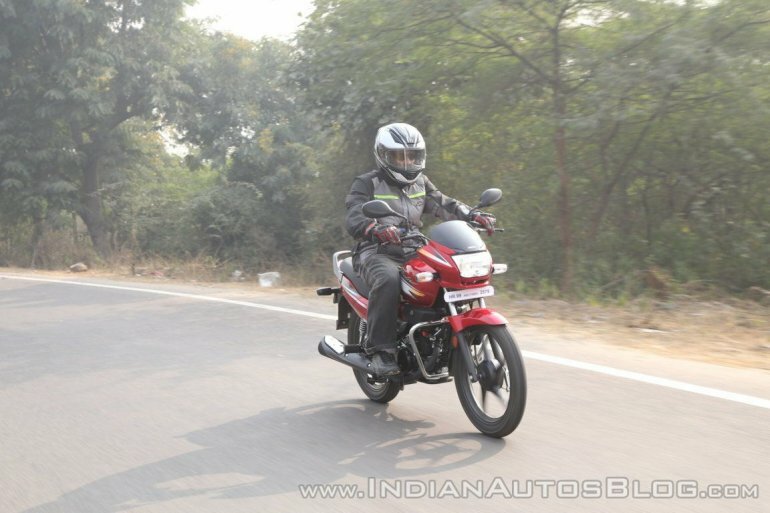 Hero MotoCorp recently unveiled the 2018 Hero Super Splendor along with the new Passion Pro and the Passion XPro. The major change is the engine, which Hero has developed in-house. Let’s see how the new bike is on the road. The 2018 Hero Super Splendor has similar design lines as that of the previous generation motorcycle. The bike retains the boxy headlamp design, with the small faux intake below the unit. Hero says that the target audience prefer the sober design, and hence they did not want the new generation bike to look too different. The side profile gets some minor changes in the storage compartment below the tank; and the side box now features grey accent, which keeps the design interesting. The LED tail light is smaller, and sits neatly within the tail bodywork. The exhaust heat shield features chrome plating at the rear, and the bike gets new graphics as well. 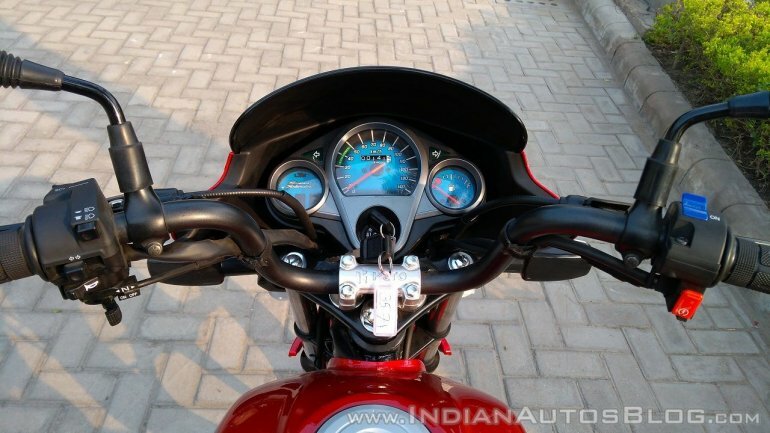 The analogue instrument cluster is a three-pod unit which houses the speedometer, fuel gauge, and the tell-tale lights. The motorcycle gets a small underseat storage, and the utility box under the tank is apt for keeping the paperwork. Always Headlight On (AHO) feature is standard in compliance with the latest norms. 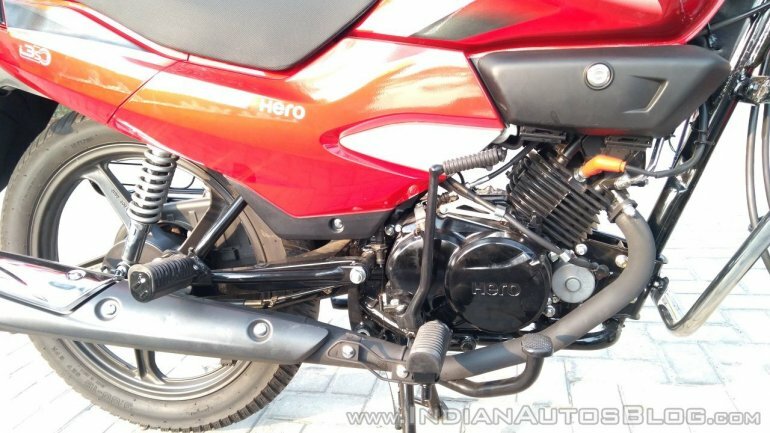 Powering the 2018 Hero Super Splendor is a 125 cc single cylinder TOD (Torque On Demand) engine that also does duty in the new Glamour. The OHC mill produces 11.4 PS of power at 7,500 rpm, and 11 Nm of torque at 6,000 rpm. 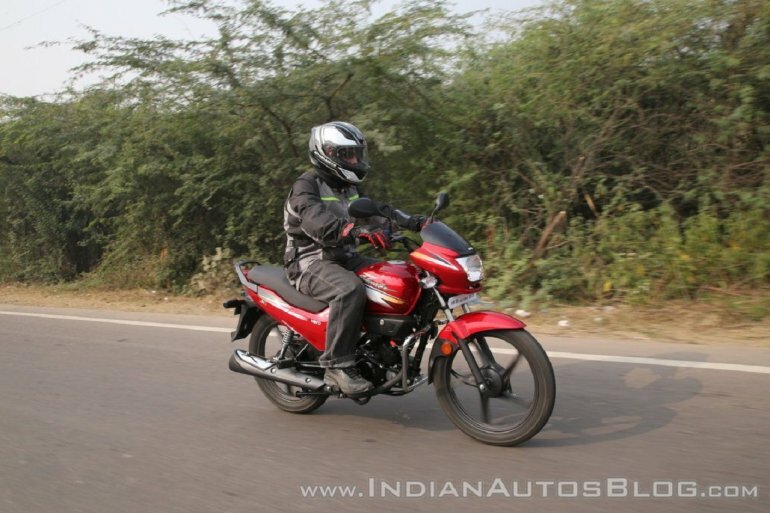 Hero MotoCorp says the new Super Splendor’s engine makes 27% more power and 6% more torque than its previous generation. The spread of the power is wider across the rev-band, and the engine is butter-smooth. It is gratifying to give this commuter the beans, as it darts forward carrying its 124kg heft with ease. The bike can reach a maximum speed of 94 kmph. The four-speed transmission has neatly spaced ratios, with a tractable top gear. The vibrations are intrusive only post 70 kmph, and can be felt through the tank panels and footpegs. While we could not perform a fuel efficiency test in our brief test ride, expect excellent range from its 13-litre fuel tank. Additionally, the engine also features i3S technology which switches it off when idling after a few seconds. The engine comes back to life on pulling the clutch lever. This feature helps in conserving fuel during long traffic stops, and can be disabled as well. The 2018 Hero Super Splendor’s seat is 785 mm above ground, and the riding position is pretty upright. The handlebars are easy to reach, and the single-piece seat is adequately cushioned. The front features telescopic fork, and the rear gets twin shock absorbers. The suspension is well-sorted for Indian roads, with spine-forgiving damping. Brakes include 130 mm drum on both ends, which lack outright bite, and feel as well. Hero could’ve given the front disc brake as an option, especially because the Passion Pro and the Passion XPro get one. With the 2018 Hero Super Splendor, the Indian auto major eyes to strengthen its presence in the 125cc motorcycle market. The company has a 57% market share this financial year, growing all the way from 31% in FY 2012. Hero will reveal the price of the 2018 Super Splendor in January. While the older Super Splendor costs INR 56,215, ex-showroom Delhi, expect the new version to be around INR 1,500 more expensive. 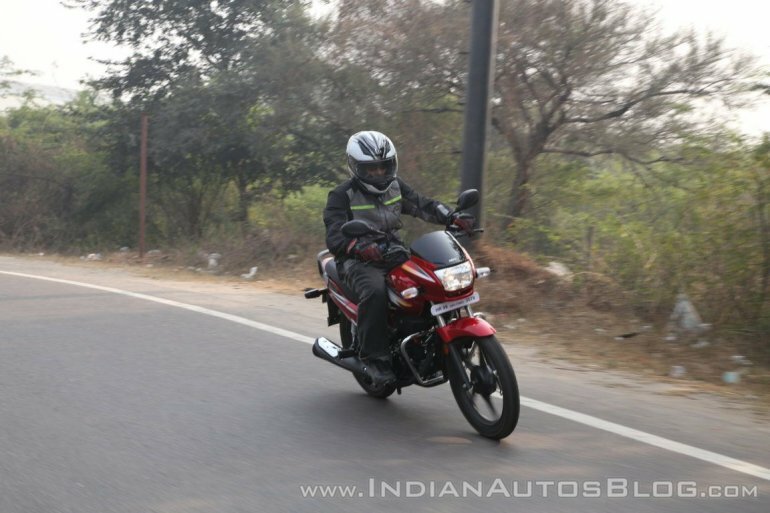 The primary rivals of the 2018 Hero Super Splendor include the Bajaj Discover 125 (INR 53,171); Honda CB Shine (INR 56,147), and Yamaha Saluto (INR 53,898). All prices ex-showroom Delhi for the base variant. 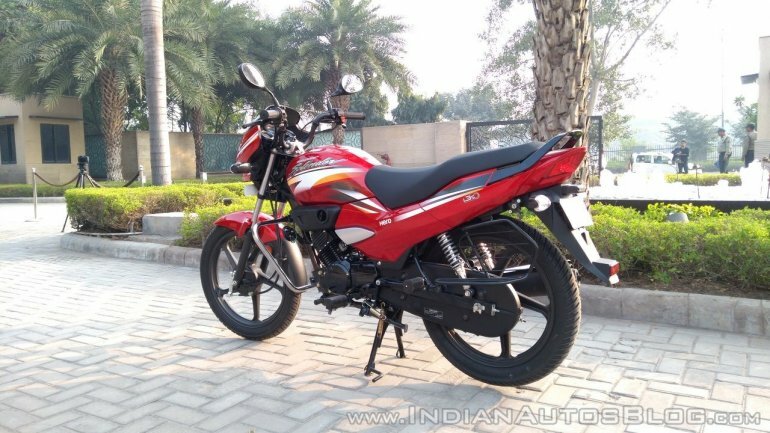 The 2018 Hero Super Splendor will serve its purpose well for customers looking to buy a conservative but adequately powerful 125cc commuter with good brand service reach.